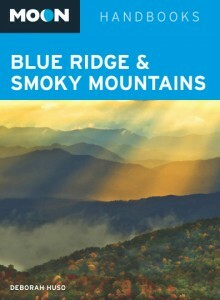 Help me clear my office bookshelves of my last several copies of Moon Blue Ridge and Smoky Mountains (Avalon Travel, 2010). I’m selling signed copies directly from my web site for $11.00, and yes, that’s actually cheaper than Amazon.com. The first edition of Moon Blue Ridge and Smoky Mountains is part of Avalon Travel’s popular Moon Handbook series and provides an insider’s perspective on where (and where not) to go when traveling along the Blue Ridge Parkway and in the Great Smoky Mountains. What overlooked sights should you be sure to see? What mob scenes should you avoid? Where are the best uncrowded hiking trails? And where can you find the most delectable dishes in the southern mountains? My book is an ideal companion for independent travelers looking for real advice (as well history, culture, and commentary).